Five years ago, the Guangdong village of Wukan was in the international news being touted as the potential birthplace of a new democracy in China. 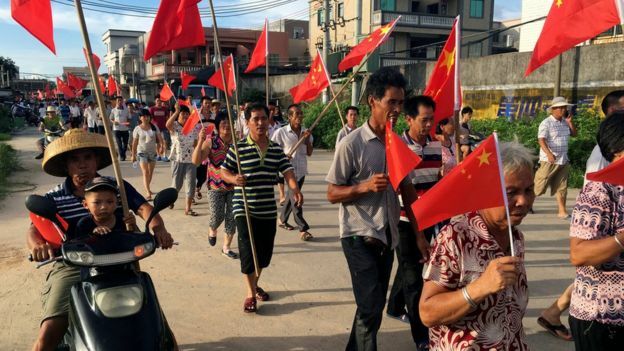 After months of protest in the summer and fall of 2011, residents were allowed in March of 2012 to select their own local leaders from a slate that wasn’t dictated by the Communist party. Even Chinese state media picked up the story then, though they spun it as the understandable consequence of citizen anger at illegal land seizures, using the case to chastise officials who Beijing claimed were out of touch with the common folk and their complaints. Now, in 2016, Wukan is the scene of violent confrontations between residents and the government. The story of Wukan [乌坎] has been a seductive one for many observers—a tale that fits very nicely in the Establishment Narrative of New China: suddenly angry and empowered peasants seeking to overthrow authority and establish a experiment that would eventually produce wider political change in a country purportedly crying out for it. That idea appeals to those who like change from below in China, led by a romantic figure or two who take heroic acts against oppression. Human rights activists, lawyers, feminists, students—anyone outside officialdom who finds the Chinese government repugnant is then elevated to the status of “change maker”. When it’s villagers fighting for their land rights, the story becomes even more appealing to observers, some of whom see it as their job to give these protestors voice—as if they weren’t capable to doing that themselves. In 2011-2012, many commentators portrayed Wukan as a game-changer for China, the spark that would light a prairie fire under party officials and compel them to open up the political process, thereby challenging Communist rule. To change China, it only takes a village. Or so the story goes. It was nothing of the sort then, and it’s nothing of the kind now. In fact, what happened in Wukan the first time around wasn’t unique. Many villages throughout China already had local elections, and while the Communist party overwhelmingly dictated the acceptable candidates, the slate usually included officials that residents at least knew, even if they weren’t ones that they necessarily preferred. Indeed, Chinese villagers weren’t always seething with anger at this state of affairs; if they had been, there would have been many more Wukans before then. (Protests in China evolved locally and they were solved locally then and now.) Rural residents had other problems to deal with--economic growth, dwindling population because of the migration of residents to nearby cities, and other specifically local issues. They knew that village elections were really “selections” —and they elected to go along. What was different in Wukan was that there were not only illegal land seizures, but also a local protest leader--Lin Zuluan--who was unafraid to mobilize protestors on his behalf and try to co-opt the existing system to run for office himself. Lin was (and remains) as articulate as he was fearless; made himself available to the foreign press; and won much local support, especially when he insisted on opening the Wukan village accounts to see just how much money local officials had managed to receive from developers and not distribute to residents. With the Guangdong party apparatus’ go-ahead to stand for office, Lin got himself elected. He fit the Establishment Narrative profile to near perfection (he was in his late 60s after all then, not the young rabble-rouser that many observers believe to represent a “New China”): an individual (so he’s not part of a collective, but a “hero” in the best Western tradition, so he can be singled out for praise); he was active and available for interviews; and he opposed the existing power structure. Lin was seen as a grassroots reformer, whose influence would surely spread beyond Wukan. But the promised political renaissance in Wukan itself quickly ran into reality. Chinese local government is notorious for being run by cliques, sometimes families, supported by higher-level officials interested in exploiting a region’s resources (land, minerals, labor) for their own particular purposes. Wukan wasn’t an exception, and Lin and his allies very quickly encountered the problem of getting local power-holders to return seized land and start engaging in transparency. The foreign press largely left, having reported the story that more than a handful wanted to hear, because many believed that an election in Wukan had kick-started political change in China. State media pulled back too, and active support from some in Beijing for what Lin was trying to do locally began to recede. Lin’s adversaries—that is, Wukan’s main stakeholders—gradually sought to take advantage of dissension in the village that followed Lin’s election when he was unable to deliver on his promises. Lin might have been serving as party secretary of the village, but the real power was above and around him, and that situation hadn’t changed at all. What kicked off these latest protests in Wukan isn’t a longing for more democracy but an attempt to help Lin stay in office when others—possibly in Beijing, almost certainly in Guangdong--want him out and think they can finally make that happen. Lin’s enemies—likely developers and their local patrons who wanted to clear more land--seem to have engineered a power play and managed to get Lin charged with graft this past June. Lin did what village leaders have done for decades: He threatened protests and for that he was detained—unsurprisingly, because the laws governing such activity have been noticeably tightened in the past 2 years. After Lin’s arrest, his supporters called for his release, demonstrating in the village for nearly 3 months without success. Last week, Lin received a jail sentence of at least three years (based in large part on what appears to have been a bogus confession), and it’s that verdict that’s sparked the assaults and anger from his people and government security forces, each with their own sources of support inside and outside Wukan. Wukan is demonstrating once again the real limits of local people power in China. As of Wednesday evening, Chinese state authorities continue to censor reports of the protests, and have been scrubbing social media sites of mentions. Foreign journalists looking to broadcast about the contretemps in Wukan aren’t allowed anywhere near—which isn’t exactly shocking either. For many in the international media, Wukan is again the main show. That’s in large part because it has all the ingredients of a courageous local struggle against State power, complete with a citizen uprising, stone-throwing, truncheon-swingers, angry authority wading in and being pushed back by a populace eager to defend their rights. It’s great theater for some, especially because what was once seen as triumphant is now turning tragic. But for Beijing, Wukan has always been a sideshow, and it’s time to shut it down. Indeed, for the Chinese leadership, the main act is elsewhere. While Wukan seethed, coverage of the expulsion of 45 deputies in China’s National People's Congress from the northeast province of Liaoning for vote buying and bribery led yesterday’s edition of People’s Daily. That's because Beijing believes that the greatest threat isn’t from grassroots movements but graft at the top. Not for the first time, outside observers and Chinese officials are looking in opposite directions.